Katrina Lenk's and Tony Shalhoub's characters have an almost-romance in The Band's Visit. When songwriter David Yazbek, whose mother is Jewish and father Lebanese, decided to write a musical that fused his two cultural backgrounds, he knew he didn't want it to be about tribal conflict. His new Broadway show, The Band's Visit, attempts to do something that seems almost unfashionable: look at two historically antagonistic cultures and tell a story about their commonality. It all started when a producer contacted Yazbek about adapting a 10-year-old Israeli movie for the stage: The Band's Visit. In the movie, an Egyptian ceremonial police band gets stranded in a town in the middle of the Israeli desert. When the townspeople discover the musicians are stuck for the night, they invite them into their homes. That's pretty much the plot. Yazbek says the musical follows the film's lead in dramatizing the situation by not overtly dealing with the tensions between Israel and Arab countries. "If you were to point a finger at it, you would distract from what the movie is really about," Yazbek explains. "This could be a movie about any two groups, even Democrats and Republicans." Itamar Moses, the playwright who adapted the film's script, says the show's message resonates more now than when he and Yazbek were writing it. "It suddenly felt really urgent to say that people are people," says Moses. "And when you strip away politics and the sort of rigid tribes that we seem to cling to and belong to, everybody can connect over the need for food and shelter and music and the need for love itself." As for the musical's score, it certainly doesn't sound like a typical Broadway musical. Tony Shalhoub, best known as the TV character Monk, plays the Egyptian band leader. He says that it's the first musical he's ever heard that "has Arabic music and Israeli music and people singing in both languages." Some of the actors also play instruments, like violinist George Abud. "When you're a Lebanese actor, or an [Arab] actor, in New York, you go in for certain roles," Abud says. "And you are kind of destined to play certain situations. And most of the situations are politicized or religious or terrorists. And then finally we get a play where everybody's just being a person." In a series of vignettes, the Egyptian band members and their Israeli hosts get to know one another. There are stressed-out parents, angsty teens, and a band member obsessed with Chet Baker. Shaloub's band leader has an almost-romance with a café owner played by Katrina Lenk. Lenk says that these two somewhat lonely characters, with complicated histories, discover "that magical thing that can happen when you meet a stranger and suddenly you feel like you can tell them things that you can't tell people that are your good friends." Shalhoub thinks that the musical's choice to not emphasize the political conflicts between Egyptians and Israelis has almost become a political choice in itself. "[The musical is] political almost by virtue of the fact that it isn't," Shalhoub says. "It isn't a story about politics. And somehow, today everything becomes political. It's the prism we all look through now." Which, The Band's Visit suggests, might not be the only way to look at things. David Yazbek's mother is Jewish, his father Lebanese. In his newest Broadway musical, "The Band Visit," (ph) Mr. Yazbek wanted to write about the meeting of those two cultures. And as Jeff Lunden reports, his show focuses on the commonality not the clash. JEFF LUNDEN, BYLINE: It all started when a producer contacted David Yazbek about adapting a 10-year-old Israeli movie for the stage. "The Band's Visit" is about an Egyptian police band stranded by mistake in a town in the middle of the Israeli desert. KATRINA LENK: (Singing) Stick a pin in a map of the desert. Build a road to the middle of the desert. Pour cement on the spot in the desert. That's Bet Hatikvah. Welcome to nowhere. DAVID YAZBEK: The tensions between Israel and the Arab countries without overtly dealing with it. If you were to point a finger at it, you would distract from what the movie is really about. This could be a movie about any two groups, even Democrats and Republicans (laughter). LUNDEN: The film's script was adapted by playwright Itamar Moses. He says the show resonates more now than when he and Yazbek were writing it. ITAMAR MOSES: It suddenly felt really urgent to say that people are people and when you strip away politics and these sort of rigid tribes that we seem to cling to and belong to, everybody can connect over the need for food and shelter and music and the need for love itself. TONY SHALHOUB: (As Tewfiq, foreign language spoken). LUNDEN: The score certainly doesn't sound like a typical Broadway musical. Tony Shalhoub, best-known as the TV character Monk, plays the Egyptian bandleader. SHALHOUB: Yeah, it's the first musical I've ever heard of that has Arabic music and Israeli music and people singing in both languages. LUNDEN: Some of the actors also play instruments, like violinist George Abud. GEORGE ABUD: When you're a Lebanese actor - an Arabic actor in New York, you go in for certain roles, and you are kind of destined to play certain situations. And most of the situations are politicized or religious or terrorists. And then finally we get a play where you kind of - everyone's just being a person. LENK: That magical thing that can happen when you meet a stranger and suddenly you feel like you can tell them things that you can't tell people that are your good friends. LUNDEN: They learn they both have similar taste in Egyptian music and movies. LENK: (As Dina, singing) Umm Kulthum and Omar Sharif came floating on a jasmine wind. SHALHOUB: It's political almost by virtue of the fact that it isn't. It isn't a story about politics. And somehow, today everything becomes political. It's the prism we all look through now. 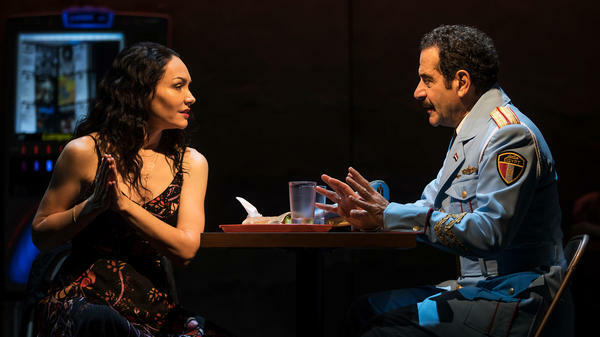 LUNDEN: Which "The Band's Visit" suggests might not be the only way to look at things. For NPR News, I'm Jeff Lunden in New York. Transcript provided by NPR, Copyright NPR.